Ecometals Limited is pleased to announce completion of the mobilization of the diamond drill to the Rio Zarza Gold Project and set up on the first drill site. For Quality Assurance, the drilling will only commence in early January 2010, as drill core and sampling cannot be left incomplete without dispatch to the analytical laboratory, which is closed over the Christmas holidays. The Rio Zarza Gold Project is located north of Zamora, the district capital of Zamora Chinchipe province, south-eastern Ecuador. The project adjoins the Kinross (formerly Aurelian) exploration license which covers the Fruta del Norte epithermal deposit with a reported 13.7Moz Au (Micon, 2007). Exploration results to date on the Rio Zarza project indicate anomalous gold and associated pathfinder elements typical of epithermal-style mineralization in a package of sedimentary and volcanic rocks formed in a pull-apart structural basin. Anomalous IP chargeability is indicative of sulphide mineralization, and detailed magnetic surveys indicate complex faulting. Hydrothermal alteration including bleaching, advanced argillic and chloritic alteration, and particularly sulphides and silicification are typical and analogous to the Fruta del Norte deposit. Initial holes are structural and stratigraphic and targeted on geophysical anomalies as there is no direct evidence of mineralization at this early stage. 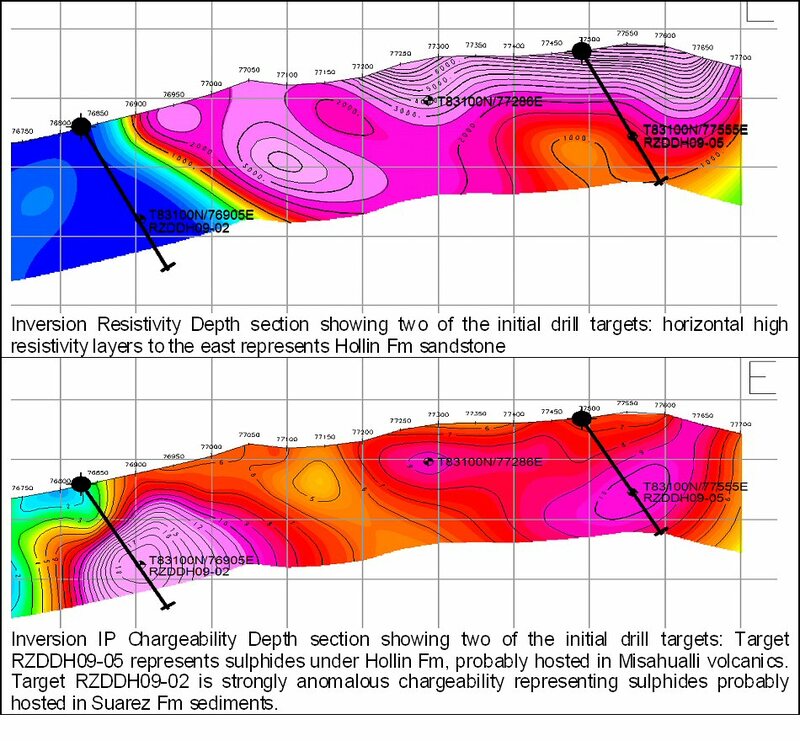 The drill is set up on Target RZDDH09-05, and is planned to test sulphides in Misahualli Fm volcanics under the Hollín Fm sandstone cover. A fault is interpreted from the offset in the base of the Hollín formation, with the IP Chargeability anomaly in the footwall. Subsequent holes will test various types of geophysical anomalies in different structural scenarios, and the conceptual exploration model will be refined as more information is gained about the underlying rocks. If initial results are encouraging, the drilling campaign will continue, and complete up to 5000m drilling under the same contract conditions with TerraNova Drilling SA. Core will be transported from the drill site to the Rio Zarza camp, where geological logging and sampling for geochemical analysis will be conducted. Samples will be despatched using full chain of custody documentation to the ALS Chemex sample preparation laboratory in Quito and analysed at the ALS Chemex laboratory in Lima, Peru. ALS Chemex is an ISO certified laboratory. Drilling, sampling and dispatch will all be under the direct supervision of the in-house Qualified Person, SR McMullan, P.Geo. Quality Control protocols will include industry-standard insertion of control samples (blanks, internationally Certified Reference Material, and duplicates) at 10% frequency. Further details and maps of the planned drilling program can be obtained from the Ecometals Web site (www.ecometalslimited.com). Chief Executive Officer Fran Scola said, "We are pleased to start the drill program at the Rio Zarza Gold Project on completion of all the necessary permits and regulatory requirements. The Company strives to maintain the highest standard of excellence on sampling and analysis, so the short break over Christmas is necessary for assurance of quality of the results." SR McMullan, P.Geo, Vice President of Exploration for Ecometals Limited, is a qualified person according to National Instrument 43-101 definition and has supervised the preparation of the technical information included in this press release. Ecometals Limited is a Canadian-listed mineral exploration and development company focused on mineral resources in Latin America. Ecometals also has significant manganese and iron projects in Brazil at grass roots and development planning stages. Safe Harbour Statement: Statements contained in this release that are not historical facts are forward-looking statements which involve risk and uncertainties, which could cause actual results to differ materially from those expressed in forward-looking statements. These include risks relating to changes in economic or environmental conditions and the company's ability to execute its business model and strategic plans. The company relies on litigation protection for forward-looking statements.